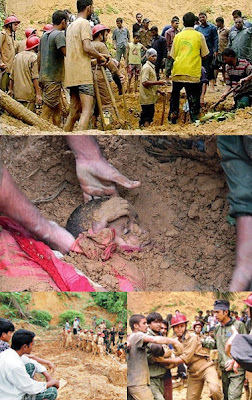 Bangladesh faced a terrible tragic on 11th June 2007. Indiscriminate hill cutting during the last three decades has led to the disappearance of over one hundred hills and partial destruction of hundreds others in Chittagong city, causing environmental hazards and raising the incidence of landslide, experts said. Landslides in last few days killed more than 100 people in the port city, raising such death toll during the last three decades to over 200. So as part of our joint effort we from somewhereinblog community and me, Sadiq requesting you all who chance upon here to participate with your contribution for those incapacitated people. instruction: click on the Make a Donation button below, you are taken to a secured site. there write donation amount >> click (update total) and click (continue) from the bottom of the page. no registration required.